Model S3E-2 High Shear Film Granulators – Foremost Machine Builders, Inc.
Foremost’s High Shear Granulator has been field-proven for over 40 years, both alone and as part of complete inline film recycling systems. Intended for all types of film and other soft materials, the current design utilizes a center feed chamber and a special adjustable, precision knife arrangement. This knife design yields the scissor-like, near tangential slide necessary for efficient reduction of thin films rather than “chopping” the materials. Clean “film fluff” or granulate is the result, without tearing or heat build-up. Throughputs from 150 to over 500 lbs. per hour are achieved based on lab tests with various materials and a standard 5/16″ screen. Expected throughputs for your particular material can be determined by Foremost laboratory tests. The rotor is provided with three blades. Reliable, flange mount bearings are used and the chamber is a one-piece weldment, Blanchard ground with smooth easy-to-clean surfaces. Special models with integral sound deadening are available, utilizing Foremost’s Microsonic construction techniques; or acoustical enclosures can be supplied for standard models if required. Special Alloy knives for longer life. Dual Stage Model for High Bulk Density Output Requirements. 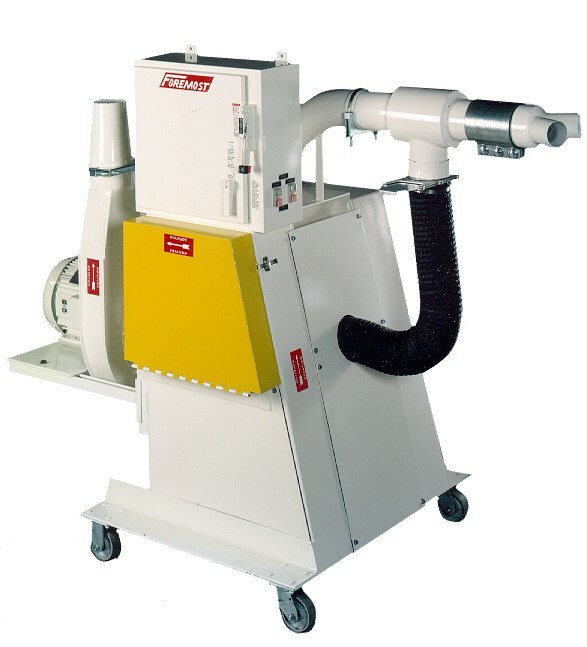 The model S3E-2V venturi granulator utilizes one common high volume integrally mounted blower to pull continuous film edge trim into the grinder cutting chamber and to evacuate the reground material. Each machine is equipped with two 3″ venturi pick-ups. All motor starters electronically interlocked and are housed in a NEMA 12 enclosure with a fused disconnect. Knives Three (3) 11 1/2″ high shear knives and two (2) 12” bed knives. Screen	 5/16″ (standard) 3/16″ 1/4″, 3/8″, 1/2″ diameter holes. Note Specifications for reference only.